You might not realize that Nanci’s chocolate and vanilla bases are rich and creamy just like soft-serve ice cream. Texture depends on how much air you get in the product and the quality of the ingredients. 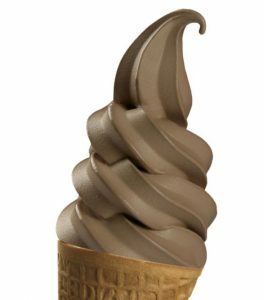 We don’t sell a soft-serve ice cream because it is so similar in creaminess to our frozen yogurt but lacks the health benefits. In fact, you could choose to serve Nanci’s and not call it frozen yogurt, some of our customers sell it as soft-serve and don’t even call it frozen yogurt at all. It is up to you how you want to name it and market it. Frozen Yogurt provides the same satisfaction and tasty treat as soft-serve ice cream with many additional benefits. -Versatile in that it can also have other tastes and textures depending on what you like best. For example, the Chocolate and Vanilla bases are just like soft-serve ice cream in sweetness and texture. The Tart bases are uniquely different from ice cream. In addition, another ba se mix which is called FRUIT WHIP is a bold and refreshing fruit soft-serve like what is served at Disneyland. And it has probiotics. What is really cool is that if you add double the water in your recipe and use a frozen drink machine, the FRUIT WHIP turns into a self-serve smoothie. See link to two machine options for self-serve smoothies made from just Fruit Whip base + flavor + water.